On the night on June 23, okagani moved toward the beach to spawn under the Super Moon on Ikema Island, Hirara in Miyako. A species of terrestrial crab known as okagani came from inland on Ikema Island in Miyako to the coast to spawn on the night on June 23. That night the full moon, known as the “Super Moon,” looked much bigger and brighter than usual. 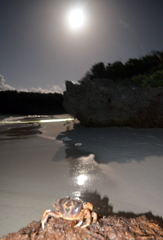 With their eggs stuck on their bellies, the crabs moved down to the beach in the moonlight. They spawned their eggs by shaking their bodies in time with the movement of the waves. The crabs started to cross the road that runs around the island at nightfall on June 23. They risked their lives crossing the road before rushing to gather on the beach for spawning. When they had finished, the crabs went back up to the land.